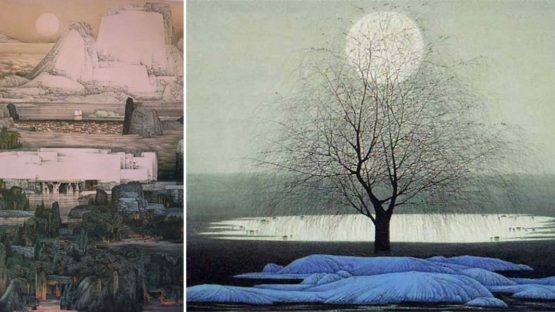 Xue Liang is a landscape painter well versed in the techniques of traditional Chinese painting who has succeeded in creating a distinctive personal style that is completely contemporary. Like the works of Sung Dynasty masters, Xue Liang’s paintings have a rich density obtained by elaborate and detailed brush work used to build up the textures of the rocks and mountains. First outlining the main forms, he then creates inner strokes echoing the greater mass. Born in Jingjiang, Jiangsu Province, in 1956, Xue Liang graduated from the Arts Department of the Nanjing Institute of Arts in 1982. He now works as a professional artist in Nanjing. He is now a member of the Chinese Artists Association, a professional artist in the Jiangsu Chinese Painting Institute and director of its Art Committee, a connoisseur of arts in the Chinese Culture Department as well as director of the Chinese Gongbi Painting Association. Structurally, his paintings are often on different vertical levels like a traditional scroll, and he shows the same preoccupation with space, recession and volume. The introduction of architectural elements signifying a human presence also seems to express the ancient Chinese belief in the unity of man and nature in landscapes. However, Xue’s skilful use of color, together with his increasing trend towards abstraction and mastery of light and shade, gives these paintings an entirely modern appearance. Characterized by a strong geometric symmetry and balance of composition, his minutely worked paintings take on a surrealist aspect as mountains, forests, lakes and cascading waterfalls are bathed in an eerie light and a huge, other-worldly sun hangs in the sky overhead. Natural organic forms are reduced and distilled into almost abstract shapes. Xue is good at landscape and flower-and-bird genre paintings. Because of his solid traditional painting technique together with his profound literature accomplishments and his unique sense of appreciation of the beauty as well as the way of his thought, he is acclaimed as the “Genius of Jiangnan”. All of his landscape works are full of spirituality of nature and illusory imagination. He has formed a new school of flower-and-bird painting with distinctive composition and rich color.